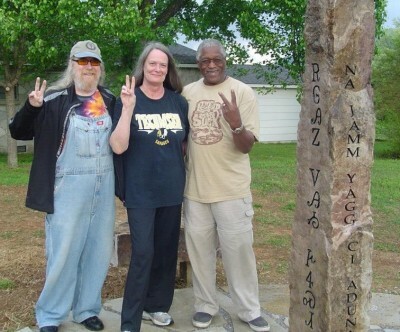 The Mountain View Arkansas Peace Pole was created and designed to reflect the wishes of the people of the Ozark Region that the phrase ” May Peace Prevail On Earth” become a reality for the 7 Generations To Come. It was envisioned and designed by a group of volunteers to reflect the Ozark Region in general, and Stone County Arkansas in particular. 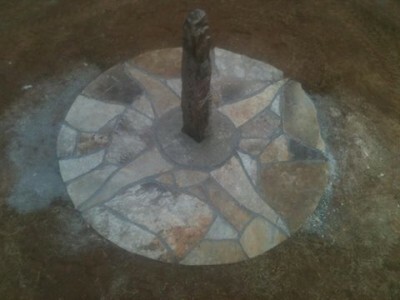 The Pole itself, the paving and the stone seating were quarried from within Stone County. Almost all of the actual work on sandblasting and construction of the Pole was done by Stone Co. citizens. The languages for the message ” May Peace Prevail On Earth ” were chosen to reflect the early inhabitants of this region. To the North it reads in the Cherokee language and alphabet. 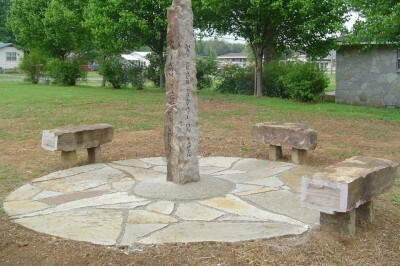 This was chosen to honor the first Native inhabitants of the Ozarks. While there were many First Nation tribes in the area, the Cherokee have their own alphabet, therefore it was chosen to honor not only the first settlers of this land, but also the suffering of the Cherokee people on the Trail of Tears. To the East it reads in the Irish-Gaelic tongue. This language was chosen to symbolize both the early European people who carved homesteads in the county, as well as the roots of the Folk, Bluegrass, and Gospel music Mountain View is known for. To the West we read the phrase in Wolof, the native language of Senegal. This is to honor the Black People, both free and slave who worked the boats that brought settlers and supplies down the rivers, and who were integral in much of the road building, construction, and in the daily life of the Ozarks as the region was settled. Finally, to the South we read it in modern English, to honor the memory of the Civil War era Arkansas Peace Society, and to express the hopes and wishes of today’s Ozark and Stone County residents. We wish to thank the AmVets Post #7 for hosting and care-taking of the Mountain View Arkansas Peace Pole, as well as the following businesses who helped finance or gave discounted services to the Project.